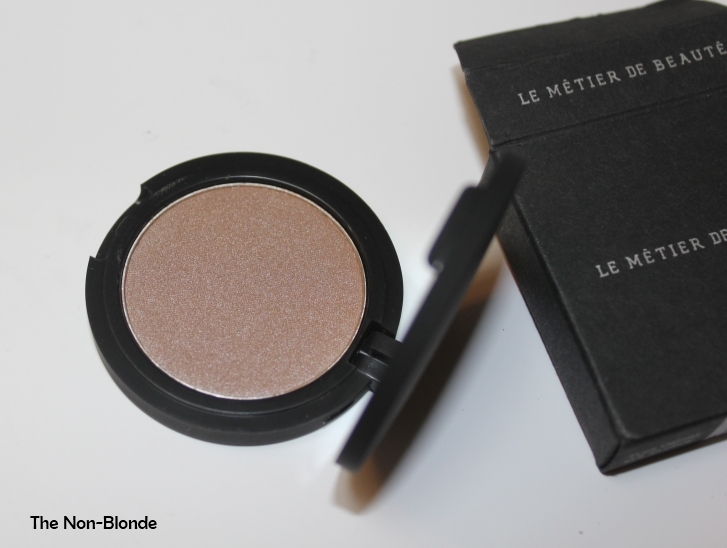 Le Metier de Beaute Mulberry eye shadow is in the category of secret weapon. It's beautiful, it's subtle and it always works, no matter what. I get compliments almost every time Mulberry is part of my makeup look. I think it makes my eye twinkle. Mulberry is hard to describe. 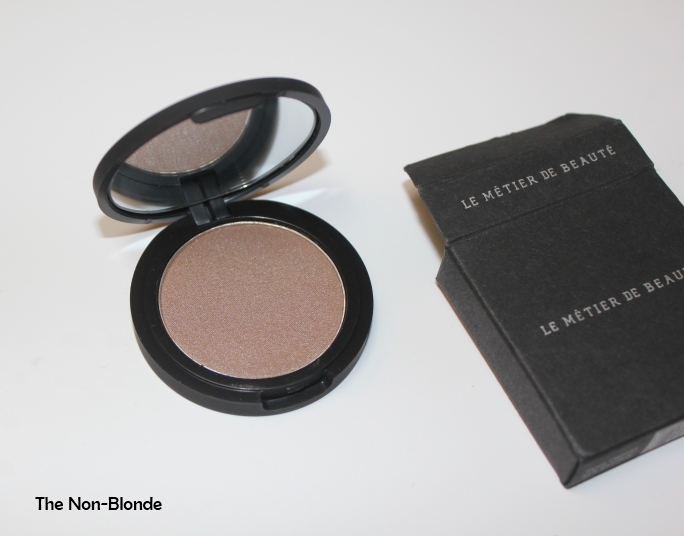 The name sounds a bit scary for those of us with purple eye phobia, but as you can see this Le Metier eye shadow is decidedly not purple. 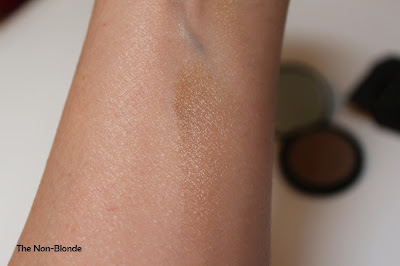 It's taupe with a light brown base that pulls mauve on my lid (less so on my arm, but my lids are darker). 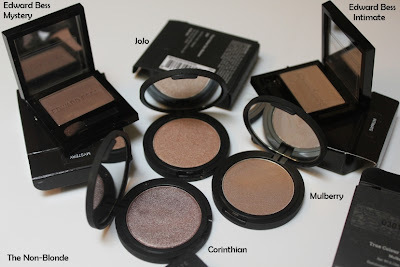 Mulberry, like all Le Metier de Beaute neutral eye shadows, is looks deceivingly simple in the pan. It's the way it interacts with the skin and eye color that makes these eye shadows the magical items that they are. 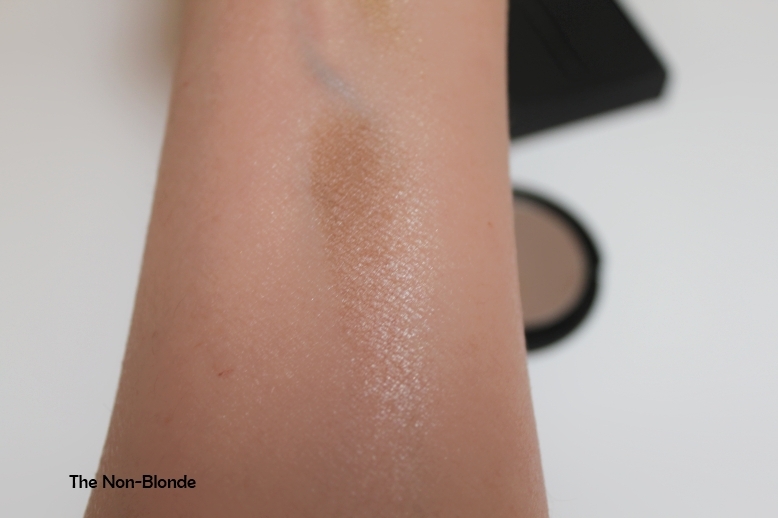 The pigment is more complex than the word "taupe" conveys. The satin texture is not only easy to apply but also extremely flattering- it's not just "color", it's makeup in the best sense of the word- items that are meant to enhance, flatter and support our appearance. As far as I'm concerned, Mulberry is a must-have color, but you can see in Everyday Beauty's review of this LMdB eye shadow that it might not be the case for someone with a very different skin tone, so take complexion and preferences into account before ordering, especially if you can't get to a Le Metier counter and see for yourself. 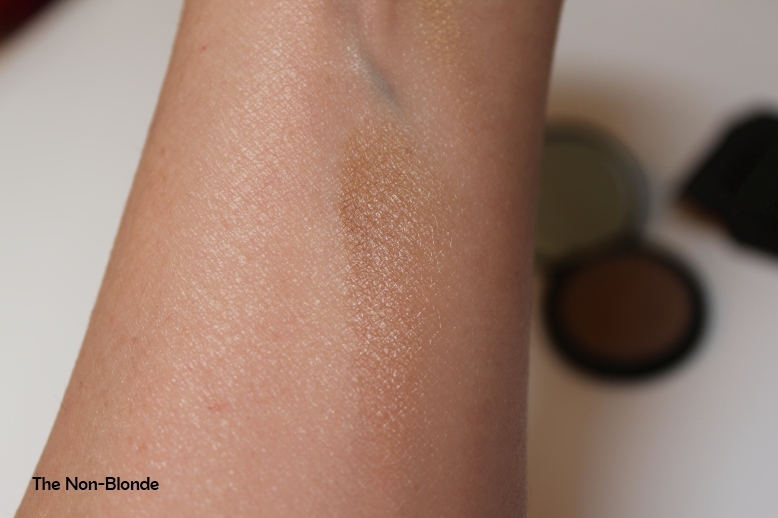 In the comparison photos you can see Mulberry next to other beautiful neutrals. You can tell it's warmer than the legendary Corinthian but cooler toned than Jojo and the Edward Bess pretties. These can all be mixed, matched and spiced up with a hint of green, navy or aubergine, depending on your preference and mood. Le Metier de Beaute single eye shadows ($30 each) are available at Berfgorf Goodman, Neiman Marcus (in store and online) as well as from Nordstrom's website and select locations. This is one time I REALLY wish I could see a product in person at the counter! Such mixed reviews on it. Are they really that mixed? I thought Jenn and I were the only naysayers. Meanwhile, I am so jealous of all of the lucky ones where Mulberry pulls mauve. I do not get compliments when I wear it. 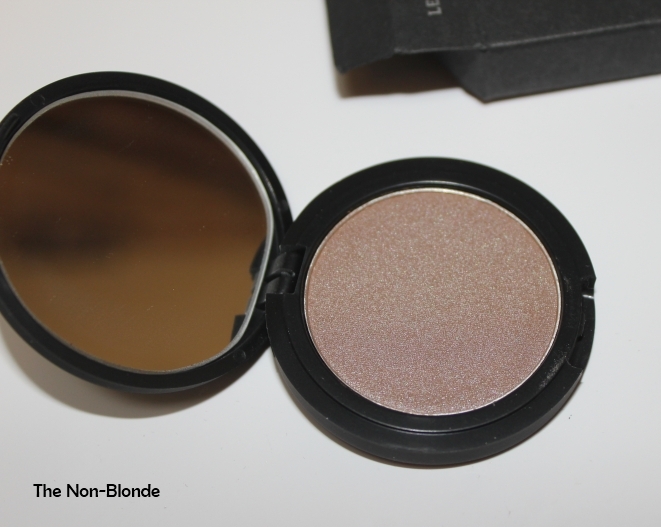 That color looks perfect for someone (like me) who has an olive complexion. 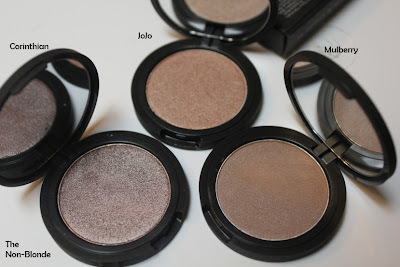 While I adore mauve-toned shadows, if they are too cool, they make me look like I have a black eye (or need a good night's sleep). I wear Corinthian and like it, but it has a touch of too much something. Often I can blend with other colors to make it more "Liz-friendly". I'd love to give this one a try as it looks much more forgiving for my skin undertone. This line is fun to play with, and the end results are wonderful. I am surprised that this color pulls mauve on you, but am happy to see how it reacts differently to different skin tones. It's still a pretty color, I was just confused by the name because on me it pulls peachy. Go figure?! This is beautifuL! I have a feeling this would look almost gold on my skin. Oh dear, I have been trying to ignore Mulberry. This does not help. It looks gorgeous on your skin. C., I know, but I'd still say that most would find Mulberry very flattering. Elizabeth, I'm pretty sure it would be perfect for anyone with even a hint of olive. I know that black eye look and Mulberry is the exact opposite. J., I wonder what undertone is responsible for the peach issue. N., it's worth a try. I can probably wear just about any color from this line. Thanks, Sophia. Don't ignore Mulberry, it's really really fabulous.